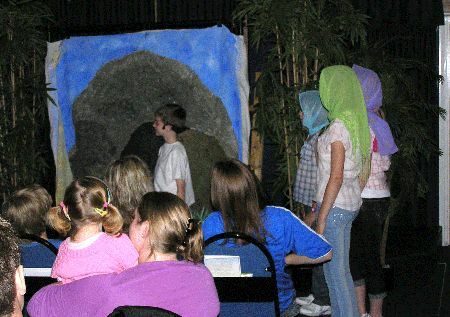 A unique, creative and unforgettable way in which to bring the Gospel story to life for children. This show within a show presents a colourful tapestry of events and emotions, moving naturally between lively humour and poignant drama, with excellent use of contrasting musical styles. The show is particularly suited to performing in full at Easter, or shorter extracts can be used for assemblies, etc. 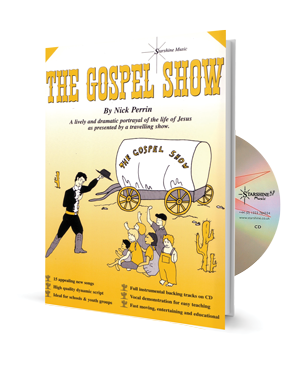 Set in the American ‘Wild West’, four travelling showmen (Matthew, Mark, Luke and John) are taking 'The Gospel Show' around the country, telling the story to children in front of their covered wagon, using 'volunteers' from among their 'audience' to act out the events of Jesus' life. Among these children is cheeky Jo, who likes to challenge the showmen with awkward questions! 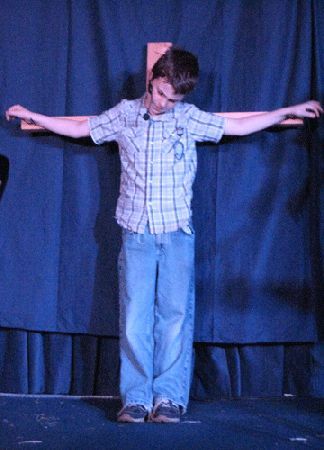 Towards the end of the show comes the crucifixion scene, which Nick Perrin has managed to write in a way that is not only powerful and dramatic, but also appropriate for primary age children to perform. This is followed by the uplifting gospel-style song, 'Roll Back The Stone', which provides a tremendously joyful ending to the show. The second half of 'The Gospel Show' (from Jesus' entry into Jerusalem onwards) has been adapted to form a narrated Easter Cantata: 'Roll Back The Stone'. 'We've done two of your shows before, and didn't think we'd ever better 'The Blue Crystal'. 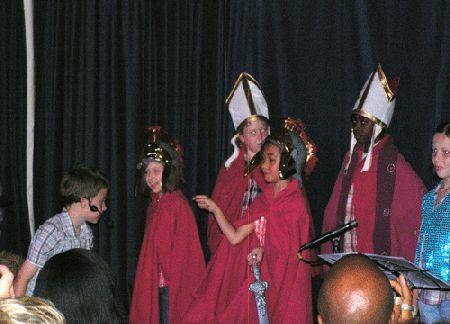 Although we are a church school, initially we felt nervous about tackling 'The Gospel Show'. However, knowing the way your musicals appeal to children, we decided to give it a go, and we were astonished at the way our pupils took to it - they were queuing up to be involved! The response from both pupils and parents was absolutely stupendous. The show brought the house down!' ~ M Orson, Headteacher, Birmingham. Absolutely fantastic! 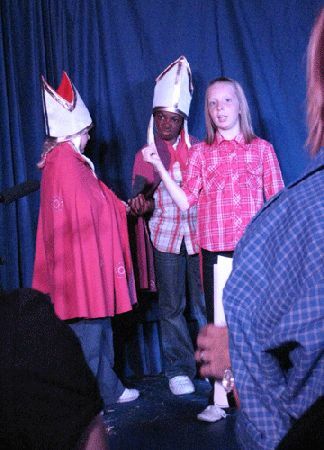 We did 3 shows and everyone, especially the parents, loved it. 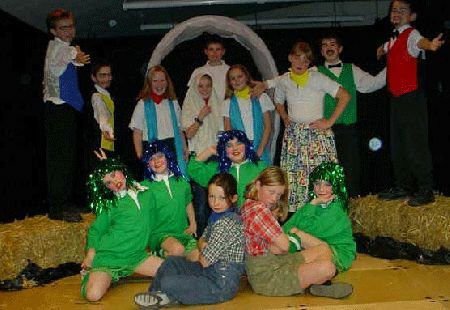 I'm a Primary school teacher and we performed your musical "The Gospel Show" at our school Easter service yesterday. I just wanted to tell you that it was a roaring success. I have produced similar productions for the last 12 years, but this was the best by far! The songs were so exciting for the pupils and the story line (we just did the latter part-the Easter story) was very powerful. One young pupil in Year 1 who was in the congregation whispered to his teacher "Miss, is it for real, or just pretend"! All good wishes and thanks. Very good! A script which was easy for the pupils to learn quickly. A truly moving musical - retelling the Gospel Story, through song, dance and drama. A great experience whether participating or watching. The show was a great success, enjoyed by audiences of all ages....the music was excellent; the children coped admirably with the harmonies - two part, three part etc....we had a brilliant show. The songs are extremely catchy and engaged the pupil's interest from the start. 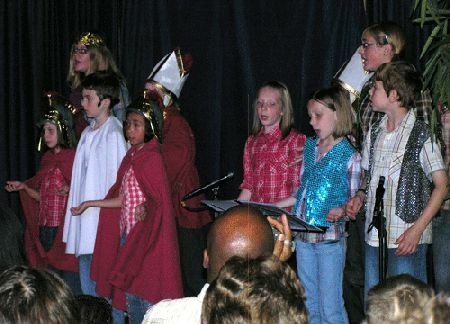 It was a 'fun' production yet conveyed the message of the Gospel to both participants and audience. It brings the standard of the West End to the pupils! The songs are absolutely wonderful. The children think it's fantastic and the most unexpected individuals have volunteered for solo parts. It was a great thrill to watch so many children discover the joy of performing, particularly with such an inspirational musical. Best We Had Ever Done. 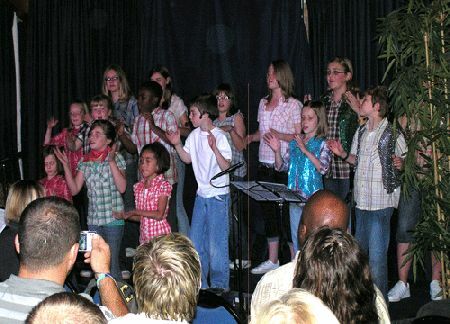 Our school has a reputation for having excellent musical performances; people said that "The Gospel Show" was the best we had ever done. It had music that was interesting and musically sophisticated without being terribly hard to learn. The performance CD was clear and easy to use in practice; the accompaniment tracks were easy to sing to and interesting to listen to. 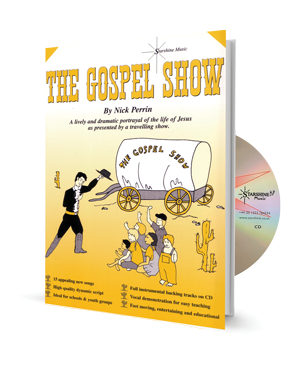 The directions for costumes, props and choreography made putting on "The Gospel Show" easy for the teachers. We performed 'The Gospel Show' as part of our Holy Week celebrations. It was a very moving experience, and musically excellent. I'd highly recommend this show to schools. A first class show. The music was catchy and spiritually uplifting. Just wanted to let you know we have just completed our two primary school performances of "The Gospel Show" and it was a great success. . I had a great group of children this year and we performed it with all children in grades 3-6 on stage, over 170 children! We used quite a few of your costume and direction ideas and threw in a few of our own. 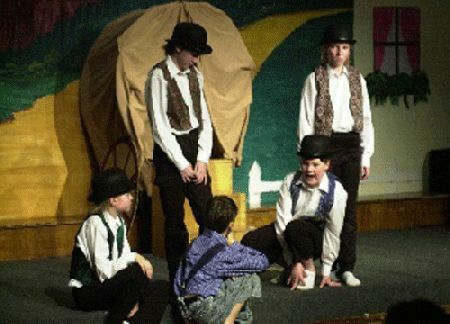 The play was exceptionally good for including lots of children and I was able to squeeze 54 children into "special" roles as well as each child doing something special with their own class. Our school choir took a lot of the extra harmony parts too and had a particularly talented group to choose soloists from so we gave out plenty of those as well. The children loved performing the show, but best of all family and friends of the children were so touched by the story, and the music, the whole school community loved it. So thank you for your web site which is where I found the show and your friendly help and advice along the way. I'll be sure and tell others about Starshine. Thanks again for your help. Review by Michelle Orson - Head Teacher, Birmingham. We've done two of your shows before, and didn't think we'd ever better 'The Blue Crystal'. Although we are a church school, initially we felt nervous about tackling The Gospel Show. However, knowing the way your musicals appeal to children, we decided to give it a go, and we were astonished at the way our pupils took to it - they were queuing up to be involved! The response from both pupils and parents was absolutely stupendous. The show brought the house down! Just to let you know we performed 'The Gospel Show' on Saturday and it was FABULOUS!